In the first part of this guide, I talked about why you need a plan to manage projects and why so many beginner project managers overlook this part. I also showed you how you can create a to-do list and make time and cost estimates. For this second part, I’ll get into more detail regarding what it takes to execute a plan and how to get closer to finishing a project on schedule without changing your budget. Knowing how you can prevent risks from occurring can help you avoid more serious outcomes. Risks can postpone your milestones and even put an end to the entire project — in the most extreme cases. Knowing when and where to look for risks is essential. Even more important is being able to create backup plans starting with the most probable risks. It’s important that all specifications are clear from the beginning. This allows you to create accurate estimates of the costs and time you’ll need to deliver the project. Concerning quality, you must establish the performance conditions and standards directly from the contract with your client. In the case of a software development project, you can come to an agreement with your client and offer two revisions to the initial version. There are countless questions you can ask yourself to avoid problems. What will you do if an employee gets sick? What should you do if the project is late? Who will be in charge of fixing the issues that appear after you deliver the project? It’s best to cover these delay and maintenance risks right from your client contract. As a rule of thumb, estimate that you’ll need more time to finish a project than you will in reality. You’re more likely to deal with a happy customer if you finish a project earlier than by postponing your milestones. Time-related risks can also keep you from launching a product or service ahead of your competitors. This means you might lose important clients and market shares due to improper timing. There are risks you can control. Cost risks usually happen when you’ve set a lower cost estimate before the start of the project. This is normal because you can face with a situation that will need more funds at any time. You can, as I mentioned before, avoid unexpected spendings with a detailed plan. Why is it necessary to prepare to face cost risks? You’re managing a project when, all of a sudden, you need a new developer to help you finish on time. Think about it: do you have the time and budget to hire somebody? You’ve set a budget estimate that doesn’t take into account additional funds to help you hire a new team member or outsource that talent. You’ll have to go without a new employee. This will delay your project and cause your client to lose profit and clients. If you had allocated additional funds for unexpected situations, this wouldn’t have happened. Still, there are some risks that you just can’t control. These usually come from external sources. Although you can’t manage these, it’s better to have a backup plan. Imagine your main competitor has received funding and he’s using it to win over part of your clients with his new services. In this case, your option is definitely not to wait and see the outcomes. Instead, you can go and find additional funding yourself or invest in your company’s development. By doing this, you can make sure that your clients won’t leave and that you might gain new ones. Performance risks happen when a product or service is not delivering the expected results. Typically, sacrificing on costs and extending delivery times can increase your performance risk. Take the following situation: You’ve assigned junior developers to work on a project because their work was cheaper. They didn’t have enough time to learn what they had to. Therefore, they didn’t finish their tasks and project on time. The final product also has bugs that will need somebody else to fix them. If you had chosen to work with experienced programmers from the beginning, you would have avoided these additional costs. You’re running a marketing agency and you’re in charge of creating a risk management plan. You’ve covered time, money, and performance-related issues, but is that enough? The obvious answer is “no”. There are other risks involved. These include problems with your contracts, local competition gaining more clients, decreased company reputation, poor team productivity, and many more. The truth is that most risks are unavoidable. Yet, what you can do is create a plan for each risk you want to combat. The most important part of the project is monitoring activity during execution. Monitoring is there for you to make sure that you’re on track with the initial plan. In fact, monitoring means you’re constantly going to be improving the first plan. Adjusting the plan as you go is related to monitoring. They are both continuous processes that help the development of the project. Project management is a constant switch between observing, acting, and changing or adjusting activities. Any new problem will require a change that will need monitoring. This could cause additional problems and you’ll have to go through the same loop until the project is completed. It ensures that you’re following the project goals and client requirements as closely as possible. You can’t let things just go their own way in a project. Your main duties as a project manager are to supervise task management, find potential problems (employees wasting time, lack of resources, poor time management, etc. ), determine how accurate your previous estimates were, and create working solutions. Change is inevitable. The simplest way of dealing with it is to revise your project’s plan and bring more resources, time, and money into use. All changes are reviewed and assessed before getting the green light. You or your clients might reject change in case you can’t implement it. You shouldn’t start work without getting permission to do so. The previously set plan, needs, and objectives are likely to change as well. Occasionally, you’ll need to adjust the project’s schedule to meet your budget or deadline. A resource scheduler can help you with this. Also known as a team scheduler, this tool shows you exactly how free or busy an employee is on a specific date. If a team member is ill or on vacation, you’ll have to find somebody else to do those tasks. You have the option to assign those tasks to another employee or to outsource that work. Meanwhile, you can use a resource scheduler to plan in advance and determine how well your work is going and if you are within the set timeline. The increased organization it brings allows you to better distribute your tasks and analyze your data in real time with less effort. Today, managing projects is easier than it was in the past. You no longer have to handle project documentation through the traditional pen and paper method. This is because you have a series of virtual tools available at hand. Bring project management tools to your project to help you oversee progress, save time, keep your team connected, and manage everything from resources to clients. You can document ny change you make at a project level through these tools. Users will be notified when a new task or project is assigned to them and even if there’s a deadline change. But maybe you just want to see how long it can take you to finish a task. In this case, you can stick with time-tracking tools. These will help you record and monitor your team and project activity in terms of their schedule and worked hours. Time tracking also improves your productivity. You can do this by taking a look at your past timesheets. You can use the data stored here to estimate future deadlines or prioritize the tasks you’re in charge of. Picture this: you’re managing a project but your team is working without tracking time. You’re behind your deadlines and you still have some tasks to finish. There’s no way of knowing how long it took you to finish the past activities and you can’t find the exact issues that caused the delay. As a result, you can’t create a plan to complete your next tasks faster. Hence the entire project will be delivered late. Without a time tracking method in use, you’re more likely not to know if some tasks are not being completed according to the established schedule. Through these, you’ll also see what is working and what you should improve. This can only make your work more efficient especially for your following tasks and projects. To have a closer look at your project’s timing, you can also create Gantt Charts. 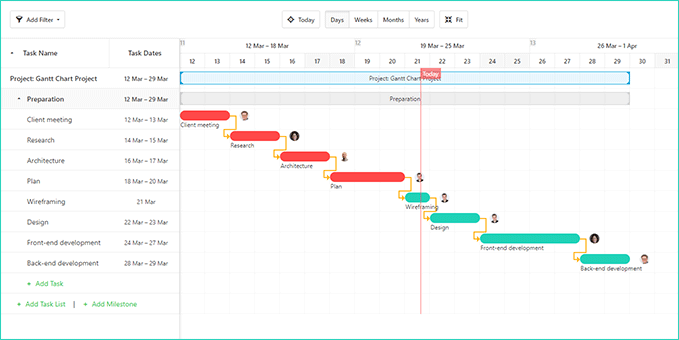 The Gantt Chart allows you to see on a visual timeline when activities start and end, who’s responsible for each tasks and what tasks have passed their due date. You can use Gantt Charts for planning tasks in a visual manner. To put it simply, they tell you what your team needs to do, when activities start, when they end, who’s responsible for them, and which tasks are related to each other (known as dependencies). Through Gantt Charts you can see which tasks have not been finished on time. As a project manager, if you don’t see a task marked as complete by a specific date, it’s your duty to see why it wasn’t finished. Using a Gantt Chart, you can easily spot that a task that is late. You talk to the designer (or anyone in charge of that task) to find out why he delayed that activity. If it’s a good reason that would improve the final product’s performance, you can postpone all related tasks. All these methods will save you time, money, and resources you would otherwise use for additional projects or improvements. The closing of a project is often overlooked. The truth is that this can be the most important part for your following projects. The information you’ve gained during a previous project could prove crucial for your next ones. You might rush into celebrating the end of the project. However, don’t forget one important thing: a retrospective analysis. To make sure you’ve gathered all data, hold a retrospective meeting. Use your client’s feedback and your team’s insights for further projects. This will help you and your organization alike. Write these ideas down and keep them safely in your archives. Put down all your opinions and motivations. For example: consider both the good and the bad decisions you took in your last project. A good one would be that you chose to estimate deadlines based on the time estimations from similar previous projects. On the other hand, a bad one that might have caused problems could be that you assigned a difficult task to an inexperienced team member. Attach these documents to a project to make them easily accessible for everyone. No project is complete without getting your client’s approval to close the project. This includes ending your contracts with all outsourced workers or resource providers. If you’re dealing with a long-term project, you’ll have to keep a number of contracts in place. For instance, imagine you have to continue maintenance work on a website. In this case, you must not end your software developers’ and QA’s duties, neither those of any hosting providers or other relevant services. Now, you can finally go on and celebrate! For inexperienced project managers, the most important goal remains for you to learn from what happened. Good and bad experiences can only help you grow and develop yourself professionally. Take each achievement and failure and turn it into knowledge for future projects. Be flexible to change and accept each risk you may face. Remember that a great team, flexible work conduct, and a well-organized plan can help you succeed even if you don’t have much experience. Share your tips for new project managers with us and spread the word to help other professionals! This article was originally posted on Paymo’s blog.